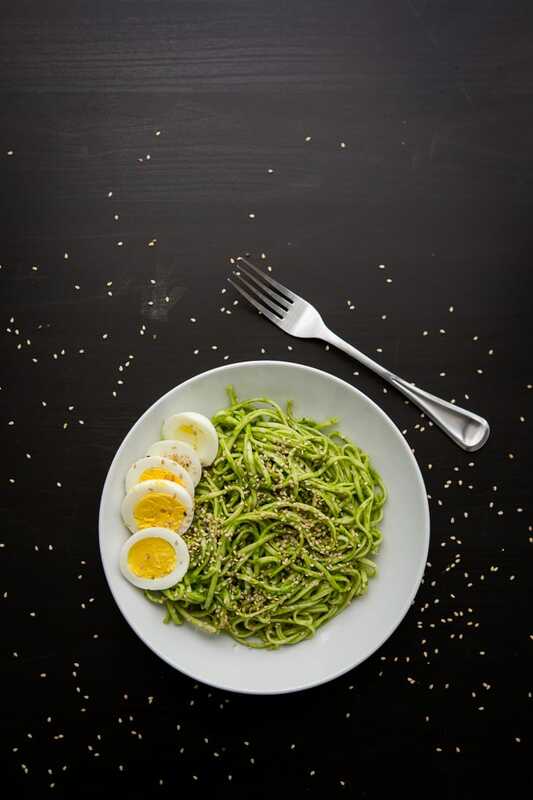 Chili Spinach Pesto Noodle Bowl | Naturally. This weekend marks 36 weeks for me and this pregnancy. It’s hard to believe time is coming to end but we couldn’t be more excited to meet this baby. However, these past couple of weeks, I’ve really slowed down which if you know me, you would also know is very unsettling. I’ve had good days and I’ve had bad days, which leads to work not getting done and me getting really down on myself for not being able to do the things I need to do (luckily M is really good at talking me out of this and usually all he has to do is remind me that I’m pregnant). This slowness has translated into the kitchen which means meals that are simple. I’ve been eating a ton of eggs as of late and one of my favorite pairings is with a hearty noodle bowl. 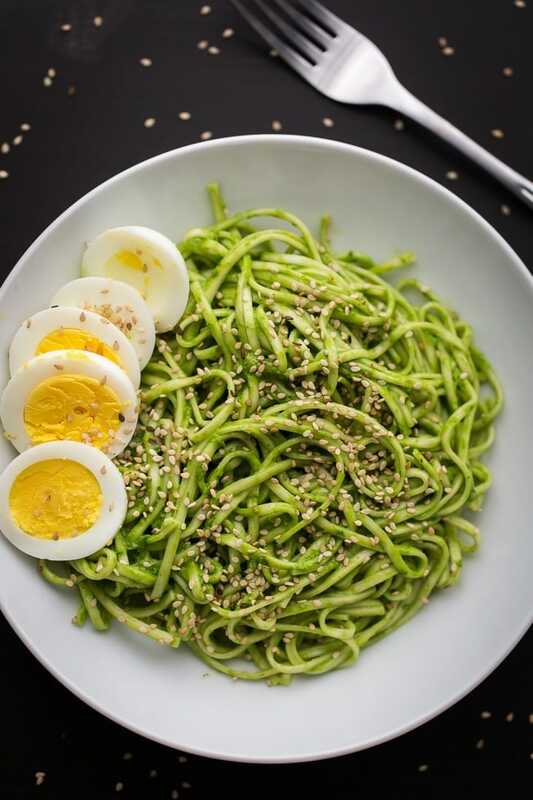 This pesto noodle bowl comes together easily and instead of using all basil, I like to mix it up and toss some spinach in as well for added nutrients (and really, it’s still super flavorful). I also keep a small jar of chili paste in the refrigerator (usually in place of sriracha) for meals like this (although right now, any spice is too much!) Feel free to use whatever type of noodles you might like- I usually mix it up between udon, soba, or for a gluten-free version, brown rice. Cook noodles according to package. Drain and rinse well. Combine ingredients for the pesto through the salt in a food processor or blender and blend until well combined, adding more olive oil if needed to make smooth. Stir in a small bit of chili paste, taste, and add more if desired (for personal spiciness preference). In a bowl, combine noodles with pesto. Serve with noodle bowl with sliced hardboiled eggs and a sprinkle of toasted sesame seeds. This noodle bowl sounds incredible! LOVE this! These noodles look delicious – I’m definitely going to give them a go! Also, good luck with the baby, it’s an amazing journey you’re going on! My theory is that breakdowns are totally normal in pregnancy, at least that’s what I told myself when I had one last night. I’ve started telling everyone not to believe anything I say because I don’t even know what I’m saying half the time because HORMONES. They are real. Thinking of you and sending all the good vibes and wishes your way for a healthy final few weeks (Ah!!) and great labor. I can’t wait to see him! This looks gorgeous! Definitely need to try it! Enjoy the last few weeks of the pregnancy! Looks like quite the healthy dish … might try making it this week! these noodles look so heavenly!! I wonder how this recipe would work with zoodles (zucchini spiralizer noodles)? Any thoughts about that from the Ella Fan Club? I think it would be lovely! Yes, I have used zucchini both lightly cooked & also raw; love it!! A dish that looks this great and can be made in 15 minutes is right up my alley! Hang in there – you’re doing great! Love your photos, as always! That noodle bowl looks super delish! This sounds like a great way for me to try soba noodles for the first time. One quick question though, where is the easiest place to find them? Are they refrigerated or in the dry stock? Thanks for your help! Hi Dayna- usually in the dry section with the other Asian pantry items (like soy sauce, etc). This is my husband’s and my go-to meal. He requests it often and calls it “green pasta” lol. It’s super quick to make, healthy and filling. I always make a double batch so there’s enough for the two of us plus leftovers for lunch the next day! We’ve tried it with both udon and soba but prefer the udon because the noodles are bigger. My husband is ethnic Karen from Burma so I put in a bit extra of the chilli for him since he likes to eat his food with a LOT of spice. He also puts different toppings onto the pasta like mushrooms or other vegetables. Such a perfect dish and so easy to make and customise.